The story is so remarkable that each of the Gospel writers include it in their proclamation. So what was it about this event that caused it to be told over and over again and why did they tell it the way in which they told it? The only way to get close to an answer is to fully engage ourselves in the story itself. The anonymous writer of the Gospel we call John wrote his account at the end of the first century, some 60 to seventy years after the event. By this point the story would have been told over and over again, and you know what happens when people tell a story over and over again…It takes on a life of its own. So, for a short time, I want you to set aside your historical hats and simply walk with me into the story to see what we can learn about how people in the year 99 might have heard this story. Six days before the Passover Jesus came to Bethany, a small town just outside of Jerusalem. Six days before the Passover the roads and pathways would have been crowded with people heading to Jerusalem to celebrate the Passover. The Passover falls on a Friday, so six days before the Passover puts us at the Sabbath. It is Jesus’ last Sabbath meal with his friends before his death. We have been told that the religious officials are seething with hatred and intrigue, plotting to arrest Jesus, just waiting for the right moment in the confusion of crowds and activities that marked the feast day. Time is running out. Jesus has six days before the conspiracy closes in on him and he is betrayed and executed. The raising of Lazarus from the dead has only complicated matters: now the officials want to kill both Lazarus and Jesus because Lazarus’ resurrection has caused many to believe in Jesus. In the midst of all this we are told that Jesus’ friends, the only three who are specifically named in the gospels as individuals whom Jesus’ loved: Martha, Mary and Lazarus, provide a dinner for Jesus who is on his way to certain arrest. Martha served them. Martha, is the head of the household, the eldest of the three friends of Jesus, and she has sent her servants away and honours Jesus by waiting on him and his followers. It is her way of expressing her gratitude, her joy at her brother’s return to life. Martha serves the Sabbath meal. In those days the Spirit of God was known as the Shekhina, which means She who dwells with us. The Sabbath is when Shekhina the one who waits in exile with the people of God until the coming of the Messiah–goes to visit- or to dwell with the righteous who gather to celebrate the Sabbath, to remember the promises, and to tell again the stories of God’s compassion and justice. For the duration of the Sabbath, the Shekhina–the Spirit of God, who is sometimes called the Word of God, abides with them at the table. Martha would have been the one to light the candles, to summon the presence of the Shekhina, and begin the ritual celebration of the Sabbath meal. It is a sacred meal; a sacred time, Jesus’ last Sabbath with his friends. Many of the words from the Torah that were to be used in the upcoming Passover ritual would have been in their minds. Suddenly, Mary enters. She takes a pound of incredibly expensive, perfume made from genuine nard. 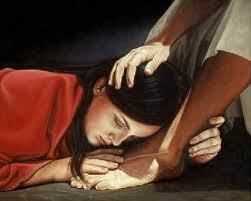 Mary goes to Jesus at the table and pours the perfume on his feet, and wipes his feet with her hair. The whole house is filled with the fragrance of the perfume. Mary spends a fortune, her fortune, she makes herself poor for Jesus. To unknowing and unseeing eyes, she is acting rashly, and recklessly. Judas angrily accuses Mary of wasting perfume that could have been sold for a market value equal to one year’s salary. Judas is indignant at such an extravagant waste of resources. At first his rationale seems innocent, even righteous–the perfume could have been sold, the money could have been given to the poor. The text goes on to tell us that Judas could care less about the poor and that he is a common thief, taking from the common purse that was used to give alms to the poor–in essence, Judas steals from the community, and from the poor. This description of Judas sheds light on his accusation about Mary’s extravagance. It reveals his greed and a mean-spiritedness in him that must publicly try to shame someone else’s good deed. At this point we are told that Jesus spoke up. Jesus will not allow such a statement to go unchallenged. He speaks loudly enough so that everyone in the room, no matter what they may be thinking, will know precisely what he thinks of Mary’s actions. “Leave her alone. She bought the ointment so that she might keep it for the day of my burial. You always have the poor with you, but you do not always have me.” Over the years these words have been used and abused by those who wish to defend behaviours that Jesus would never have endorsed. They have been quoted to mean that the poor will always be with us so there is nothing we can do about it, revealing a lack of faith, revealing selfishness and non-involvement with the needs of the poor. They have been used to validate spending enormous amounts of money on houses of worship and extravagant accessories while the poor go hungry. But those who know the scriptures know that Jesus was quoting from Deuteronomy. On the Sabbath before the Passover; on this Jesus’ last Sabbath with his friends, Jesus quotes the words of scripture. The book of Deuteronomy gives the following commands to the Israelites for the celebration of the Sabbath. Jesus is trying to tell them, what Mary probably suspects, that his death is imminent, that his presence will soon be harshly and violently taken from them. Jesus acknowledges Mary’s generous, open-handed and open-hearted gift of anointing him for burial. The highest act of mercy, in the Jewish community, was anointing for burial because the ones who performed the anointing of the dead were declared to be ritually unclean. To touch death made a person ritually impure and they had to stay away from the community while they performed the ritual of cleansing and purification. Mary’s gift is an extravagant one. Mary’s gift is outrageous. Outrageous that a household member, a woman from a respectable family, would pour ointment over the feet of a dinner guest. Outrageous that any respectable woman would appear in public with her hair unbound. Mary of Bethany loved Jesus with a passion that was outrageous. To her, the opinions of others regarding her behaviour toward Jesus meant nothing. She had heard his words, “I am the resurrection and the life” spoken before Jesus restored the life of her beloved Lazarus. Despite the dangers that surrounded them, despite the fact that Jesus was determined to go on to Jerusalem where the powers that be were sure to take Jesus from her, Mary knew first hand that Jesus already was the resurrection and so she anointed him for his burial while he was still with them. But Mary of Bethany anointed Jesus with more than just oil. In the intimacy of her touch Mary communicated her love for Jesus as he faced the most difficult of ordeals. When I was doing my hospital training, our supervisor told us about a little girl who was in need of a life saving operation that would also require a blood transfusion. She had a rare blood type and only her brother could give her the blood she so desperately needed. So the parents and the doctor explained the procedure and after considering it for a few minutes the little boy agreed to give his sister his blood. After the blood was taken from him and transported to the operating room the boy turned to his mother and asked, “So when do I die?” It was only then that they realized that the little boy thought that by giving blood to his sister he would actually be giving up his own life and he was actually willing to do just that. Some gifts are extravagant and some gifts are not. Years ago when doctors were struggling to diagnose an ailment, I had to undergo many painful procedures. Now my fear of cats is nothing compared to my fear of needles so you can just imagine the level of my anxiety when the time came for me to undergo a spinal tap. The doctors needed to extract spinal fluid in order to achieve a diagnosis. To this day I can remember the pain, but I also remember a nurse. A nurse who when things got really bad offered me her hand. As I lay there totally vulnerable and scared to death that nurse said, “just take my hand and squeeze” and as the tears rolled down from my eyes she gently wiped them away. I didn’t even know her name, but deep empathy flowed through her hands as she watched the procedure and felt it with me. And in a strange way, the pain seemed to flow away from me into my hands and beyond them into her hands. When the doctor asked me how I was doing, I realized that the nurse’s touch was helping. The nurse was there to hold my hand during a difficult ordeal. A little boy was willing to give up his life so that his sister would survive a difficult ordeal. A nurse’s tender touch made a painful ordeal bearable. Mary of Bethany was there to anoint Jesus as he faced a difficult ordeal. As we face suffering in our lives, it is Christ who comes to us and who is there to help us face difficult ordeals. Christ comes to us through the incarnation and in the Body of Christ of which we are all members. Christ comes to those in need through you and through me. Some of us will be called to give outrageously extravagant gifts. Some of us will be called to simply give. Just look at Lazarus, who sat at the table with Jesus in fellowship. When the anonymous gospel-storyteller we call John tells the story of the anointing of Jesus he includes Lazarus in his story. According to gospel-storyteller, Lazarus has just been raised from the dead. Lazarus, like his sisters Martha and Mary has a special relationship with Jesus, so special that he is the only man the gospel writers name as being loved by Jesus. The gospel writer’s inclusion of Lazarus is key. In the previous story the writer describes a scene in which only the King James version captures vividly enough, when Martha declares that Lazarus’ tomb should not be opened, because he’s been in there for 3 days, and “he stinketh!.” And so the writer takes us from stinketh to the overwhelming scent of costly perfume. From the tale of a rotting corpse that is called back into life by Jesus to the tale of Mary preparing Jesus’ body for burial. It’s priceless storytelling at its best. Storytelling that’s designed to communicate the wonders of the Jesus experiences. Lazarus’ presence is key. Lazarus’ gift was presence. By his presence and fellowship with Jesus, he expressed his friendship and his love. The gift of ourselves is often the best offering we can make. Lazarus was just there, enjoying the gift of life, with the memory of his own darkness vivid in his mind. We too are called to give the gifts of our presence. So often people will come to me and tell me that a friend or a loved one is in distress and they don’t know what to say to them or what to do for them. The most important thing we can do for our friends or loved ones when they are in distress is to give them the gift of our presence. When people are suffering they need to know that they are not alone. All of us can give the gift of a friendly ear, we can all listen. When we need to rant and rave in anger at God, sometimes we need someone whose going to hear our anger and raise a fist to God on our behalf. Sometimes when we are suffering the deepest torments, the most horrendous of losses what we need more than anything else is for some one to listen to us. When people are suffering Christ will come to them through us. In this story we are told that Mary broke open the jar of ointment and we are also told that the smell permeated the entire house. Symbolically, this beautiful act of love left a scent strong enough to last until the final day of Jesus’ life. Symbolically, this beautiful act leaves the faint but certain smell of love wafting through this worship space and surrounding all acts of love the extravagant ones and the simple ones. Sometimes life just stinketh, and the only way to overcome the stink is to break open extravagance so that the sweet sent of compassion can fill us with the love we need to endure. The scent of our own loving deeds can often last far longer than we might expect. Often our gestures of love are remembered long after we have forgotten them or out of proportion to what we thought they meant. In response to God’s extravagant love; in response to Christ’s presence in our midst, we are called to respond with love. You know, the poor, and all the other problems in this world of ours—they’re not going to go away. Taxes, bills, the concerns you have about your health and your kids and your job and the mess we’ve made of the world—those things are always going to be with you. But that moment when you look at someone and see them, and know what they are going through, and you have a sudden, spontaneous impulse to do something generous and crazy and good—that moment is not going to come again. So do it! Do that beautiful thing, the thing that love requires. Do it for the love of God. Even if other people don’t understand it. Even if they complain and criticize you for it, just like in the stories about the extravagant women who dared to be outrageous in their giving. Be extravagant like Mary of Bethany, Mary of Magdala, and the unnamed woman. Do that beautiful thing, in memory of her, for Christ’s sake! We are called to give and not count the cost. We are called to follow the path to the cross so that we can be christs to one another; we are called to follow the path to the cross so that we can also gather in celebration beyond the cross, at the empty tomb. We are called to be extravagant in our loving so that in us the fragrance of Christ can overcome that which stinketh, and together even the poor will be able to bask in the sweet aroma of extravagant LOVE. So, toss caution to the wind and be as extravagant as you can be. Let the fragrance of Christ breathe in, with and through you. We are called to give and not count the cost. We are called to be extravagant in our loving. in, with and through you. In the name of YAHWEH, Christ, and Spirit, One, Amen. This entry was posted in Progressive Theology, SERMONS, STORIES, Theology and tagged John 12:1-8 progressive christian sermon, Lent 5C sermon progressive, Lutheran sermon John 12:1-8, Lutheran sermon Lent 5C, Mary anointing Jesus sermon, progressive christian sermon, progressive christianity, progressive theology, religion, sermon anointing feminist, Shekhina, theology by Rev. Dawn Hutchings. Bookmark the permalink.